I spend a lot of time on the phone at work. Some on a land line, but mostly on my cell phone. I know it’s major dorksville to have a bluetooth headset sticking out of your ear. To top it all off, they don’t always work that great–static, poor volume and terrible noise cancelation being some key issues. I’ve tried some headsets in the past, ranging in price from $25 to $50 in the past, but was greatly disappointed in performance. I’ve been eyeing the Jawbone for a while as they were always getting good reviews. The only problem is that I had only every seen it in the $120 range. Hard to justify. As luck would have, I was in London Drugs picking something up when I saw the Aliph Jawbone Gen 1 unit on sale for $69. There was only 1 left and it was the Red one. I snatched it up. There is no doubt that I looked like an absolute dork with this red hair clip looking thing sticking out of my ear. To make me look like an even bigger tool, I ended up talking much louder than I needed to. This thing works so well, that even with background noise you can speak as though the person is right in front of you. If you are looking for a BT headset, I totally recommend these headsets without hesitation. However, I would suggest taking a close look at the 2nd generation unit as it is much more elegant looking. So what do you get an iPhone -owning-Gadget nut like me for Christmas? Do you get him case? Nope, already have that. 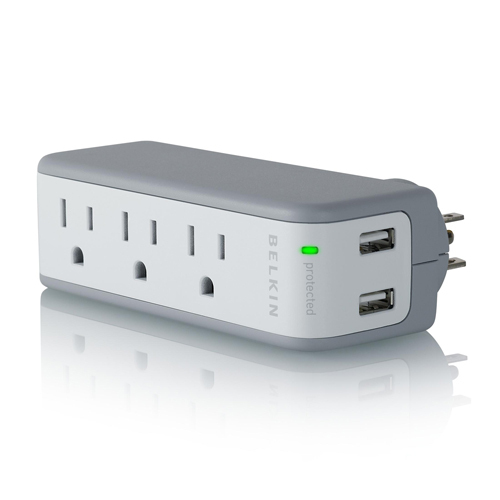 How about a travel charger? Sorry, have that too! Car charger? In the glove compartment. The WindowSeat from Griffin is the answer. I received one of these from my friend this Christmas–thanks Sam–to my excitement. It’s very much like the suction cup holders for GPS units in peoples car, but for the iPhone and iPod Touch. 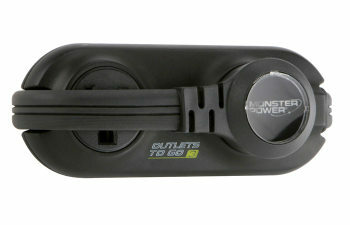 It attaches to your window or on your dash with an adhesive platform. Also included are: 3.5mm audio cable and an extension arm. I had it set up on my window in a matter of minutes, basically ready to go out of the box. However, if you want to mount it to your dash or use the extension, it will take a little longer. I tried out a few different angles, on the windshield, on the dashboard and with the extension arm. I found that there is excess vibration when the extension arm is used. This may or may not affect you depending on your car’s ride. I found extra reach of the extension very convenient but the bouncing of my iPhone was very distracting and annoying, so I went back to the regular length. Switching from portrait to landscape is a very easy twist of the wrist. Make sure that you mount it high enough to clear the dash with room to spare for the rotation and the charging cable–just in case you need it. Anyone considering this set-up may also want to invest in a bluetooth headset. The iPhone mounts very securely in the holder making it difficult to detach for phone calls–though it could be because I have an Invisible Shield by ZAGG all around. I hope that in the future they will make a case that works with this holder. It would be great to pull it out of my pocket or off my belt and put it in the holder when I get in the car. I will say that I am extremely satisfied with this product (as any product I’ve ever used of Griffin’s) and would recommend it to anyone who spends a significant time on the road. The iPhone is an awesome way to kill time on the ferry!! This was the first weekend that I headed to Victoria with my new phone, and it made the time absolutely fly. I was very sceptical of Rogers/Fido coverage for Data between Tsawwassen and Swartz bay. I expected that my internet use would drop out frequently and be super frustrating. But, to my surprise EDGE coverage is wide spread and strong. 3G isn’t too bad either. I noticed that, with 3G, I dropped my connection a few times which caused it to switch to EDGE, dropping the entire connection momentarily. If you just turn off 3G, the connection is very solid–a strong and steady signal. I’m looking forward to future ferry trips. 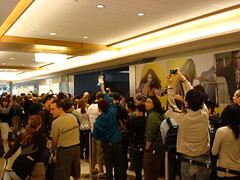 I went to the Apple Store opening in Vancouver yesterday, and to my surprise (not really), there were 2 bajillion people lined up there — there goes my free T-shirt. It was amazing. 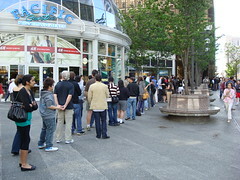 The line went from the front of the store, out the nearest exit onto Granville, around the corner onto Georgia and down the street reaching Howe. Crazy. You could hear and feel the buzz of anticipation of the crowd. It was funny watching regular shoppers come in to the mall and ask what was happening and not understand why anyone would line up for this purpose. Obviously they don’t use Apple products. The gates finally open and an massive cheering erupts, not from the crowd as you might suspect, but the employees of the store. The first bunch of people get to walk into the store lined with employees clapping and cheering as the are handed their T-shirt. It must have been nice to get that star treatment. 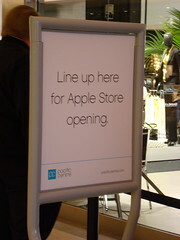 Compared to the Chicago store, which is the only one I’ve been to, it looked quite tiny. But, of course, finished in that Apple elegance. I waited to see how quickly the line would subside since I didn’t want to wait 1 or 2 hours to get in. It didn’t look like it was moving so couldn’t stick around to get in. I guess I’ll try on Monday. Edit: Pictures added. Click to see larger pictures on flickr.